Cotton Candy Fois Gras, Grasshopper tacos, Almond Gazpacho, Cretan Snails, Dragon’s Breath Popcorn... You gasp, ‘no way Jose!’ Yes indeedy, superstar chef, José Andrés has conceptualized these and many other avant garde dishes that tease and tantalize his many admirers. While the talented Senior Andrés no doubt has throngs of devoted fans, I consider myself to be one of his most loyal groupies. I’ve traveled coast to coast to dine at six of his restaurants, have worked my way through his cookbook, and faithfully follow him and his evolving career with keen interest. This is a travel blog and believe it or not, a rundown of José Andrés’ restaurants is a voyage in and of itself. Where in one city can you go to Spain, Turkey, Greece, Lebanon, China, and Mexico? The multicultural backdrop of our nation’s capitol is the perfect setting for the José Andrés restaurant empire. José Andrés allows diners in Washington, D.C, L.A., and recently Las Vegas to experience the concept of small plates done José's way. Five of his seven restaurants are located in the District of Columbia. ; Jaleo, Zaytinya, Oyamel, Café Atlantico, and Mini Bar. Each is strikingly unique and showcases Andrés’ versatility. Bazaar, located smack in the middle of the luxe lobby of the SLS Hotel in Los Angeles, is in my opinion, the love child of the Mini Bar and Jaleo concepts. My first experience with the genius that is José, as I lovingly refer to him, was with my best friend and foodie inspiration, Andra. We were in Washington, D.C. for a student government leadership conference which, while useful, was a great excuse for a vacation. Outwith the conference, we saw the sights, soaked up the history of our nation’s capital, strolled around the charming city and had a very serendipitous run-in with a little tapas bar called Jaleo. Sangria flowing, we enjoyed tapas like Patatas Bravas with Aioli, Fisherman’s Soup, Chorizo with potato purée, Grilled lamb chops with rosemary sauce, and Fruit soup with homemade cheese ice cream. An assortment of small plates covered our table with a delectable spread. We navigated our way through the comprehensive menu by sampling eight different dishes. Tapas are a Spanish concept that allow diners to taste a wide range of different flavors by sharing multiple dishes with friends. Jaleo offers a modern interpretation of the traditional Spanish way of eating; ‘José’s Way’. To really understand ‘José’s Way’ more research is required. Zaytinya is a great place to start. Located just five minutes walk from Jaleo; from 7th Street to F Street, past the National Portrait Gallery (one of my favorite places in Washington, DC), and onto 9th Street to Chinatown; the pleasant walk works up an appetite. Zaytinya means olive oil in Turkish and sets the tone for Andrés’ prettiest restaurant. The walls are Aegean blue and candles are lit in every nook and cranny. Large glass bottles of amber-colored olive oil are placed throughout the restaurant and showcase the Mediterranean’s finest export. The food at Zaytinya is Turkish, Greek and Lebanese style mezzes, similar to the Spanish tapas tradition. Small plates like hommus (purée of chickpeas, garlic and tahini), imam bayildi (Ottoman style roasted eggplant stuffed with onions and tomatoes), Cretan Snails (potato puree, garlic broth, beech mushrooms, ouzo), Kibbeh Nayah (Lebanese style beef tartare ground with bulgur wheat, radish, mint, and served with pita chips) entice the smart Washingtonians that frequent Zaytinya. One particularly chic Washingtonian, my good friend Jen, is one whom I shared many famed happy hours with at Zaytinya. It’s a great spot to share some hommus while catching up on the day’s happenings. If happy hour is what you’re after Oyamel Cocina Mexicana is another great stop. Located in the Penn Quarter neighborhood of Washington, D.C. Oyamel combines Mexico’s rich regional diversity with the modern urban atmosphere of Mexico City. Aside from the phenomenal cocktail list diners can share antojitos, Mexican style small plates, as well as an assortment of creative tacos. 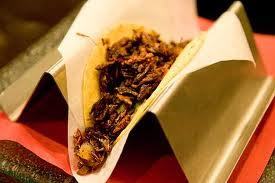 If you’re feeling brave try the grasshopper tacos or play it safe with Yucatan-style pit barbecued pork with pickled red onion and Mexican sour orange, or Sautéed seasonal wild mushrooms with garlic and shallots, served with guacamole. An absolute must is the Oyamel margarita, José Andrés’ personal favorite, with Siembra Azul blanco, Luxardo Triplum, fresh lime juice and salt “air”. Cocktails are a great strength in all of José Andrés restaurants. At Café Atlantico the Passion Fruit Martini leaves you buzzing long after the orange rum, ginger-jalapeno infusion, and passion fruit juice and espuma has left the body. The Nuevo Latino cuisine at Café Atlantico is playful and flavorful. The vibrant colors of the restaurant and chill music transport diners on a mini-vacation. Dishes like the fois gras soup with floating islands of corn and wild mushrooms; Dominican conch fritters with jicama-avocado ravioli, passion fruit oil; and Sea scallops with cauliflower purée, cauliflower ‘couscous’, cocoa butter, and American caviar leave diners with the experience of Chinese Dim Sum... Latino style. Though Café Atlantico is special, it fails in comparison to the exclusive experience of Mini Bar. A six-seat bar top located on the second floor of Café Atlantico, Mini Bar is where José Andrés really plays with his food. 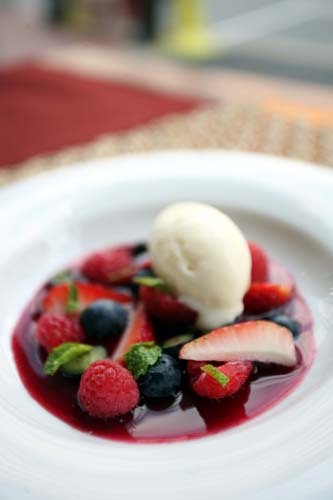 He experiments with molecular gastronomy and transforms ordinary things into unearthly culinary creations. The innovative tasting menu features 26-30 of José‘s most imaginative creations. This is food that owes as much to art and science as it does to gastronomy, food that is as much about the brain and eye as it is about the tongue and stomach, food that forces the diner to rethink food and its presentation. The exclusivity of Mini Bar is quite astounding. To make reservations you must call exactly one month prior to the day you wish to make reservations, call at exactly 10:30am and endure a constant busy signal, until your call is answered by the hostess. There are so many people that want to experience Mini Bar and with only six seats and two seatings per evening, it takes commitment and devotion, even for epicureans and José fans alike. If your heart is set on trying José Andrés’ molecular gastronomy but you aren’t able to get reservations at Mini Bar there is an alternative. The Bazaar in Los Angeles offers some of highlights of the gastronomical circus that is Mini Bar. Set in the luxe lobby of a Beverly Hills hotel, oozing with flamboyant glamour, The Bazaar maintains the same theatricality of Mini Bar but is more accessible. I made reservations three days in advance and was promptly accommodated on my first call. The menu is separated into traditional tapas (much like the food at Jaleo) and contemporary tapas (much like the food at Mini Bar). Don’t worry, you don’t have to choose! You can mix it up and get the best of both worlds. The ‘Philly Cheese Steak’ is like no cheese steak you’ve ever tried and the El Bulli Olive, is an experience you’ll never forget. The olive is an emulsion of perfect olive purée, encapsulated with the sodium alginate process, and then brined. When you bite into it, there is a little snap through the skin, and then your mouth floods with intense olive oil. This is what you wish an olive could be. My devotion to Andrés’ cuisine was tested when I visited The Bazaar. I did not falter, I did not waver. I did whatever was necessary to eat there. I was visiting Los Angeles with my husband and one year-old son. We had arranged a babysitter, whom without warning failed to show up. We waited and waited and finally decided to cart along our toddler to one of the most sought after restaurants in L.A.. As inappropriate as it was to bring my son along; I couldn’t, I wouldn’t give up my reservation and The Bazaar experience. It was indeed a bazaar experience with a toddler. The wait staff looked at us as though we were dining with an alien. When we asked for a high chair they stared blankly, like deer in headlights. They managed to round one up…from somewhere in the hotel. On the drive over my husband and I prepared a list of everything we wanted to order…to save time once seated. We were working with a 45 minute time frame before our little ticking time bomb exploded into tantrums of boredom. Each dish arrived to our table and we enjoyed every one with unbridled enthusiasm; snapping photos and savoring each creation, letting the flavors linger on the tongue before swallowing. After the initial shock of hosting a child in their posh restaurant wore off, the wait staff and hostesses began approaching our little gourmet with smiles and waves as he politely enjoyed an assortment of bazaar offerings. José Andrés has fostered the small plate concept and has built a culinary empire. From coast to coast, and with flavors from around the world, this forty-two year-old Spanish chef has endowed throngs of Americans with a love for tapas. Andrés' food is centered on the concept of sharing innovative food with friends over good conversation…preferably about food. Tapas, mezze, Dim Sum, Antojitos, tasting menus...you name it! José Andrés does small plates with a twist- 'New Way Jose'. Check out my favorite Jaleo recipe, Patatas Bravas. Check out my favorite Jose Andres dessert recipe, Chilled Fruit Soup. Note: China Poblano, Andrés newest addition located in the Cosmopolitan Hotel of Las Vegas, is now open...surely the best bet in Vegas. Really interesting post and i love your idea behind of this.